Geissler Market Bloomfield this Saturday 3-9-2016 presents: fresh yellow bananas, chicken angus beef loin boneless sirloin steaks fresh 80% lean ground beef hamburg, land 0 lakes american cheese, 1% lowfat milk galon, fresh local grown tomatoes, fresh broccoli crowns, entenmanns full line sale, store italian sausage, fresh whole seedless watermelon, cheez-it snack crackers, fresh seedless red grapes, fresh spanich, hotel style turkey breast, roasters ground coffee, yoplait greek yogurt, large pizza, olymel imported ham, margherita genoa salami or sandwich pepperoni, russer wunderbar bologna, mother goose liverwurst, boars head maple honey breast, panera soups, chicken with rice medley, baked cod dinner, vegetable lasagna, italian grinder, fresh store baked crusty frensch bread, tribeca ovens large french baguette, fresh store baked puff pastry bites, fresh store baked onion rolls or portuguese rolls, fresh store baked homestyle cookies, previously frozen wild caught cod fillets, previously frozen wild caught tilapia fillets, tender sea scallops, fresh littleneck clams, domestic wild caught frozen shrimp, cooked shrimp, sea gold crab or lobster dip, dockside classics lobster or crab cakes, tortilla crusted tilapia fillets. Also you get at Geisslers Supermarket: fresh tender green asparagus, fresh sweet large cantaloupes, fresh honeydew melons, fresh bartlett pears, fresh loose granny smith apples, imported red yellow or orange peppers, fresh steak cut mushrooms, simple beginning salad blends, fresh loose sweet potatoes, fresh loose yams, fresh onions. 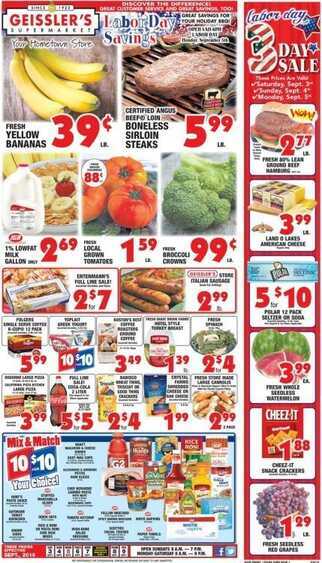 See more by visit the site: Supermarket Weekly Ads.